This might be the biggest victory in Stuart Bingham's 16-year career. 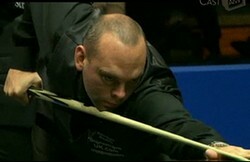 Bingham completed a dramatic fightback from 5-8 down to win 9-8 over Mark Williams. Australian Goldfields Open is also his first ranking title, big congratulations! Stuart Bingham had a narrow win. Bingham started off quite well which was 3-1 up before Williams went 4-3 up on him. It was all square 4-4 before second session started. Bingham had a poor performance in the beginning of second session. Having lost three frames in a row to be 4-7 behind, Bingham started to chase after Williams. Bingham saved 3 match points to force a decider with 69, 76. Bingham did not slip the chance to hit 47, despite the cueball is off. Mark Williams lost his direction under huge pressure. 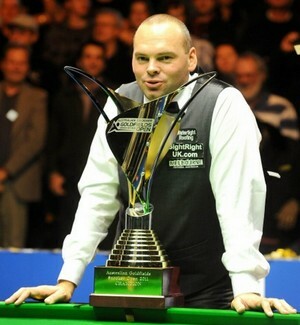 Bingham locked a 9-8 victory - his first ranking title at 35 age. "This is without doubt the best week of my life - it's just an unbelievable feeling,""I don't care what anyone says. I have this for the rest of my life and no one can take this title away from me. "I've been knocking on the door but now the door is open and I've walked through it and grabbed the trophy with both hands." Stuart said: "This proves the depth in the standard of snooker and shows anyone on the tour can win a tournament if they knuckle down and put the hard work in, that's all I've done. - This is very true. be the next one to win. Stuart beaten Ding Junhui, Mark Allen, Shaun Murphy and Mark Williams on his way to trump - very convincing win. 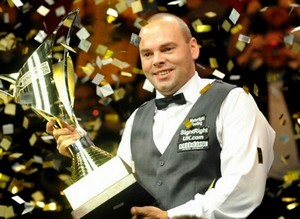 Bingham showed he has got the bottle to overcome the pressure. He showed his mental at the end and it's not too late. He played relaxingly after 5-8 down. Well deserved winner. 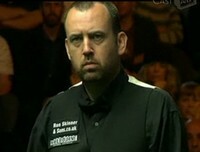 For the runner-up of Australian Goldfields Open, Mark Williams ended his hope on his 19th ranking title. World Number 1 Williams suffered a similar defeat last year in UK Championship, losing to John Higgins 9-10 despite being led 9-5. Good luck to Mark for the new season. I wish he will forget this sad defeat and win more titles. Who will be the next Australian Goldfields Open Champion? It was a good final and indeed a good tournament. The Aussie Crowds are enthusiastic, they provided an exciting atmosphere to the players. Moreover, players are delighted with the tables, they played enjoyable snooker to the audience. I look forward to next year's Australian Goldfields Open in Bendigo.